This is the third post in the bloggERS series #digitalarchivesfail: A Celebration of Failure. 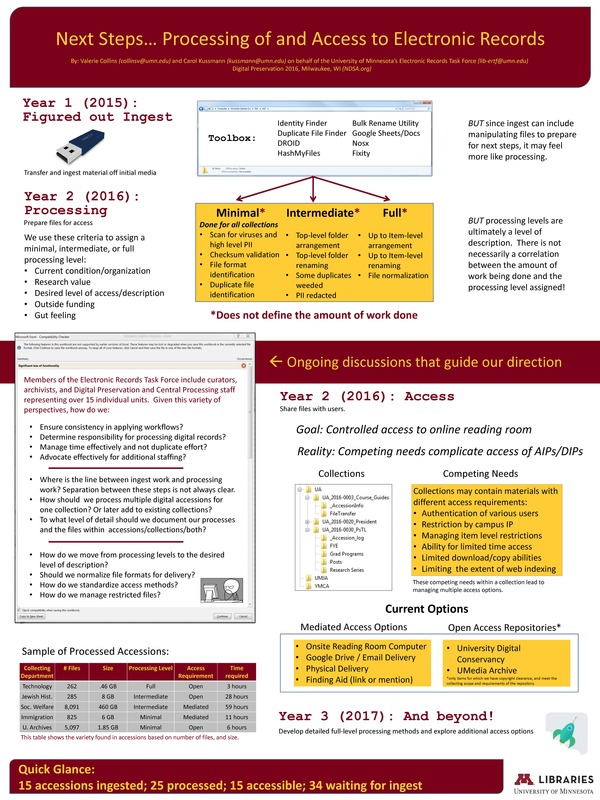 The Electronic Records Task Force (ERTF) at the University of Minnesota just completed its second year of work. This year’s focus was on the processing of electronic records for units of the Archives and Special Collections. The Archives and Special Collections (ASC) is home to the University of Minnesota’s collection of rare books, personal papers, and organizational archives. ASC is composed of 17 separate collecting units, each focusing on a specific subject area. Each unit is run separately with some processing activities being done centrally through the Central Processing department. We realized quickly that even more than traditional analog records processing, electronic records work would be greatly facilitated by utilizing Central Processing, rather than relying on each ASC unit to ingest and process this material. In keeping with traditional archival best practices, Central Processing typically creates a processing plan for each collection. The processing plan form records useful information to use during processing, which may be done immediately or at a later date, and assigns a level of processing to the incoming records. This procedure and form works very well with analog records and the Task Force initially established the same practice for electronic records. However we learned that it is not always efficient to follow current practices and that processes and procedures must be evaluated on a continual basis. The processing plan is a form about a page and a half long with fields to fill out describing the condition and processing needs of the accession. Prior to being used for electronic records, fields included: Collection Name, Collection Date Span, Collection Number, Location(s), Extent (pre-processing), Desired Level of Processing, Restrictions/Redactions Needed, Custodial History, Separated Materials*, Related Materials, Preservation Concerns, Languages Other than English, Existing Order, Does the Collection need to be Reboxed/Refoldered, Are there Significant Pockets of Duplicates, Supplies Needed, Potential Series, Notes to Processors, Anticipated Time for Processing, Historical/Bibliographical Notes, Questions/Comments. A few changes were made to include information about electronic records. The definitions for Level of Processing were modified to include what was expected for Minimal, Intermediate, or Full level of processing of electronic records. Preservation Concerns specifically asked if the collection included digital formats that are currently not supported or that are known to be problematic. After these minor changes were made, the Task Force completed a processing plan for each new electronic accession. After several months experience using the form, Task Force members began questioning the value of the processing plan for electronic records. In the relatively few instances where accessions were initially reviewed for processing at a later date it captured useful information for the processor to refer back to without having to start from the beginning. However, the majority of electronic records that were being ingested were also being processed immediately and only a handful of the fields were relevant to the electronic recorded.. The only piece of information being captured on the Processing Plan that was not recorded elsewhere was the expected “level of processing” for the accession. To address this, the level of processing was added to existing documentation for the electronic accessions eliminating the need for creating a Processing Plan for accessions that were to be immediately processed. The level of processing itself soon became a point of contention among some of the Electronic Records Task Force members. For electronic records, the level of processing only defined the level at which the collection would be described on a finding aid – collection, series, sub-series, or potentially to the item. The following definitions were created based on Describing Archives: A Content Standard (DACS). Minimal: There will be no file arrangement or renaming done for the purpose of description/discovery enhancement. File formats will not be normalized. Action will generally not be taken to address duplicate files or PII information identified during ingest. Description will meet the requirements for DACS single level description (collection level). Intermediate: Top level folder arrangement and top-level folder renaming for the purpose of description/discovery enhancement will be done as needed. File formats will not be normalized. Some duplicates may be weeded and redaction of PII done. Description will meet DACS multi-level elements: described to the series level with high research value series complemented with scope and content notes. Full: Top level folder arrangement and renaming will be done as needed, but where appropriate renaming and arrangement may also be done down to the item level. File normalization may be conducted as necessary or appropriate. Identified duplicates will be removed as appropriate and PII will be redacted as needed. Description will meet DACS multi-level elements: described to series, subseries, or item level where appropriate with high research value components complemented with additional scope and content notes. Discussions between the ERTF and unit staff about each accession assisted with assigning the appropriate level of processing. This “level of processing,” however, did not always correlate with the amount of effort that was being given to an accession. For example, a collection assigned a minimal level of processing could take days to address while a collection assigned a full level of processing might only take hours based on a number of factors. Just because the minimal level of processing says that there will be no file arranging or renaming done – for the purpose of description/discovery – does not mean that no file arranging or renaming will be done for preservation or ingest purposes. File renaming must often be done for preservation purposes. If unsupported characters are found in file names these must be addressed. If file names are too long this must also be addressed. Removing identified PII while not necessary for the description, better protects the University. The less PII we need to manage, the less risk we put ourselves in. Deleting duplicates (as much as the “level of processing” tries to limit this, as someone who needs to manage the storage space, continually adding duplicates will cause problems down the line). We have a program that easily removes them, so use it. Therefore the “level of processing”, while helpful in setting expectations for final description, does not provide accurate insight into the amount of work that is being done to make electronic records accessible. In order to address the lack of correlation between the processing level assigned to an accession and the actual level of effort being given to the processing of the accession, a Levels of Effort document was drafted to help categorize the amount of staff time and resources put forth when working with electronic materials. The expected level of effort may be more useful for setting priorities then a level of processing as there is a closer one-to-one relationship with the amount of time required to complete the processing. This is another example of how we were not able to directly apply procedures developed for analog records towards electronic records. The key is finding the balance between not reinventing the wheel and doing things the way they have always been done. Carol Kussmann is a Digital Preservation Analyst with the University of Minnesota Libraries Data & Technology – Digital Preservation & Repository Technologies unit, and co-chair of the University of Minnesota Libraries – Electronic Records Task Force (ERTF). Questions about the activities of the ERTF can be sent to: lib-ertf@umn.edu. Lara Friedman-Shedlov is Description and Access Archivist for the Kautz Family YMCA Archives at the University of Minnesota Libraries. Her current interests include born digital archives and diverse and inclusive metadata. This is the first post in the bloggERS series #digitalarchivesfail: A Celebration of Failure. They say you learn more from failure than from success. FIAT was a great teacher. This is a story about never giving up, until you do: about the project where nothing went right, and just kept going. It takes place at the University of Texas, Austin, School of Information (iSchool) in the Digital Archiving course. A big part of that class is the hands-on technology project, where students apply archival theory to legacy hardware, digital records, or a mix of both. Our class had three mothballed servers and three ancient personal computers available; my group was assigned the largest (and oldest) of the retired School of Information servers, a monster tower-chassis Dell PowerEdge 4400 called FIAT. Our assignment was clear: following archival principles, gain access to the machine’s filesystem, determine dates of service, inventory the contents, and image the disks or otherwise retrieve the data. We had an advantage in that we knew what FIAT had been used for: the backbone server for the iSchool, serving the public-facing website and the home directories for faculty, staff, and students. In light of this, we had one additional task: locate the old website directory. Hopefully, at the end of the semester, we would have a result to present for the iSchool Open House. As the only one in the group with Linux server experience (I’d been the school’s deputy systems administrator for about a year), I volunteered as technical lead and immediately began worrying about what would go wrong. It would be easier to list what went right. We got access to the machine. We estimated manufacturing and usage dates. We determined the drive configuration. We were able to view the file directory, and we located the old iSchool website. The catalog of dead ends, surprises, and failures is rather longer, and began almost immediately. None of us had done anything like this before, but I had enough experience with servers to develop specific fears, which may or may not have been better than the general anxiety my group members suffered, and turned out to be largely misplaced. I was sure that FIAT had been set up in a RAID array, but I didn’t know the specifications or how to image it. (1) To find out without directly accessing the machine– which might have compromised the integrity of its filesystem– we needed its Dell service tag number. If we could give that to the iSchool’s IT coordinator (my boss), Dell’s lookup tool would tell us what we needed to know. The service tag had been scraped off. That was annoying, but not fatal. Since we had the model number, we could find a manual; with access to the iSchool’s IT inventory, I could look up the IT control tag and see what information we had. From this, we determined that FIAT was produced between 1999 and 2003, could have been set up for either hardware or software RAID depending on a hardware feature, and was probably running the operating system Red Hat v2.7. That gave us a ballpark for service life. It didn’t move us forward, though, so while my compatriots researched RAID imaging strategies, I looked for another route. Best practice for computer accessions calls for accessing the machine from a “dead” state, so that metadata doesn’t get overwritten and the machine can be preserved in its shutdown state. For us, that meant booting from a Live CD, a distribution of Linux which runs in the RAM and mounts, or attaches, to the filesystem without engaging the operating system, allowing us to see everything without altering the data. My thought was that we could boot that way and then check for a RAID configuration at the system level: open the box with the crowbar inside it. And it would have worked, too, if it weren’t for Murphy. 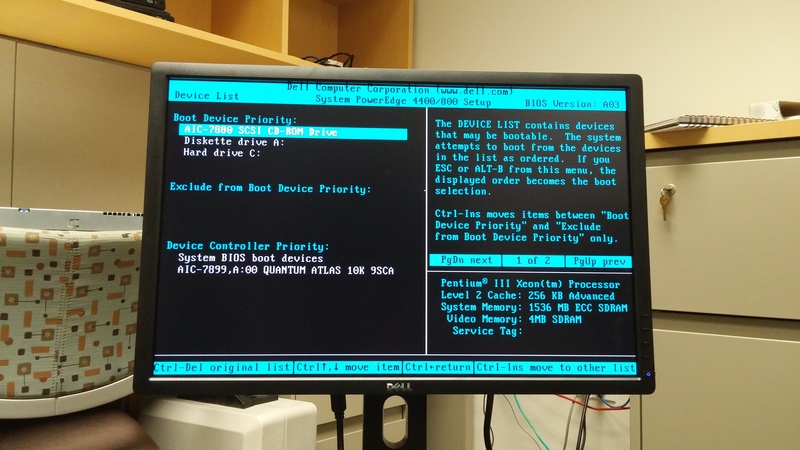 After making the live CD, we turned FIAT on and adjusted the boot order in the BIOS so we could boot from the disk. We learned three things from this: first, and most frighteningly, one of the drive ports didn’t show up in the boot sequence (and another spun up with the telltale whine of a Winchester drive going bad, increasing the pressure to get this done). Second, the battery on FIAT’s internal clock must have died, because it displayed a date in May 2000 (which we figured was probably when the board had been installed). Third, neither the service tag number nor the processor serial number appeared in the BIOS, so we still couldn’t look it up. Changing the boot order in the BIOS: note the blank where the Service Tag number ought to be. Carrying merrily on, we went ahead with the live CD boot. What happened next was our mistake, and I only realized it later. Though Knoppix (the Linux OS we were running from the live CD) started and ran, the commands for displaying partitions and drives returned no results, and navigating to /dev (where the drives mount in Linux) didn’t reveal any mount points. Nothing in the filesystem looked right, either. What had happened (and a second attempt made this apparent) was that Knoppix hadn’t mounted at all. It was just running in the RAM. We hadn’t noticed the error message that told us this because we were too excited that the CD drive had worked. Knocked back but hardly defeated, we took a week off to email smarter people and regroup. Knoppix failing to mount and unable to debug. The next thing we did involved a screwdriver. Popping the side off to read the diagram and locate the RAID controller key– or not, as it happened–was mildly cathartic and hideously dusty. I spent the next three days sneezing. 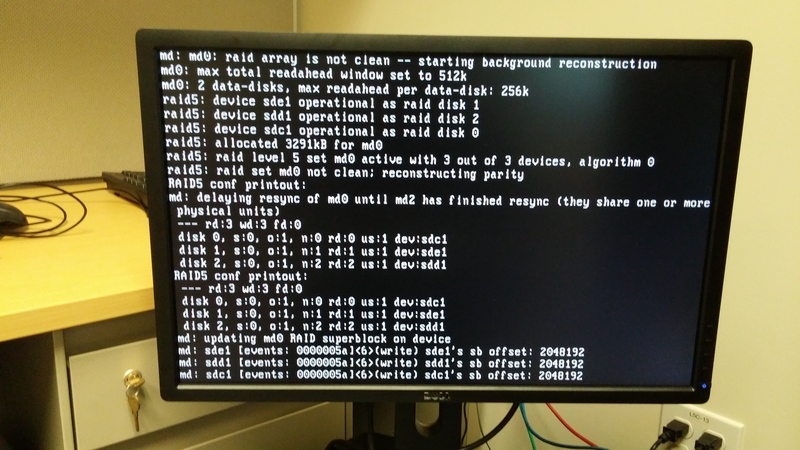 Without a hardware controller, I was certain that the machine had been set up with a software RAID; since our attempts to boot from the CD had failed, I proposed that we pull the drives and image them separately with the forensic hardware we had available. My theory was that, since the RAID was configured in the software, we could rebuild it from disk images. This theory did not have a chance to be disproved. That blue thing between the chipset and the rail is where the hardware RAID controller key wasn’t. Unscrewing the faceplate and pulling the drives gave me a certain amount of satisfaction, I’ll admit. It also solved the mystery of the missing drive: the reason why one of the SCSI ports wasn’t coming up on the boot screen was that it was empty. With that potential catastrophe averted, we imagined ourselves well set on our way to imaging the disks. Until we discovered that the Forensic Recovery of Evidence Device Laptop (or FRED for short) in the Digital Archaeology Lab didn’t have cables capable of connecting our 80-pin SCSI-2 drives to its 68-pin SCSI-3 write blocker. And that, despite having a morgue’s worth of old computer cables and connectors, there wasn’t anything in the lab with the right ends. That’s when I started fantasizing about making FIAT into a lamp table. So, while my comrades returned to preparing a controlled vocabulary for our pictures and drafting up metadata files (remember, we never actually gave up on getting the data), I called or drove to every electronics store in town, including the Goodwill computer store. I found a lot of legacy components and machines, but nothing that would convert SCSI-2 to SCSI-3; so I put out a call to my nerd friends to find me something that would work. With their help, I found an adaptor with SCSI-2 on one side and SCSI-3 on the other. When it arrived, I met up with one of my groupmates at the Digital Archaeology Lab, where the two of us daisy-chained the FRED cables, write blocker, our connector, and the (newly labeled according to our naming convention) drives to see what would happen. The short version is: nothing. The SCSI-2 to SCSI-3 to write blocker to FRED-L daisychain that didn’t work. The longer version is: complicated nothing. Some of the drives, attached to the power supply and write blocker, didn’t turn on at first, then did later without us changing anything. The write blocker’s SCSI connection light never lit up. FRED never registered an attached drive. We tried several jumper combinations, all with the same result: when we could get the drives to turn on at all, the write blocker couldn’t see them, and neither could FRED. Having exhausted our options for doing it the right way, we explained the situation to our professor, Dr. Pat Galloway (who I think was enjoying our object lesson in Special Problems), and got permission to just turn FIAT on and access it directly. I put the drives back in, we tried booting with Knoppix again just in case (revealing the error), then changed the boot order back and watched it slowly come back to life. Of course no one had the password. Our major success! The RAID 5 rebuilding itself. This is where it got weird. And exciting! Prior to this, we’d been frustrated- afterwards, we upgraded to baffled. After watching FIAT rebuild itself- as a RAID 5 array- we had to figure out what to do next: how to image the machine, and onto what. We made three attempts to connect FIAT to something, or something to FIAT, each of which resulted in its own unique kind of failure. After noticing a SCSI-3 port on the back of FIAT–a match to the one FRED’s write blocker cables–and with no idea if this would even work for a live machine, I proposed plugging the two together to see what happened. 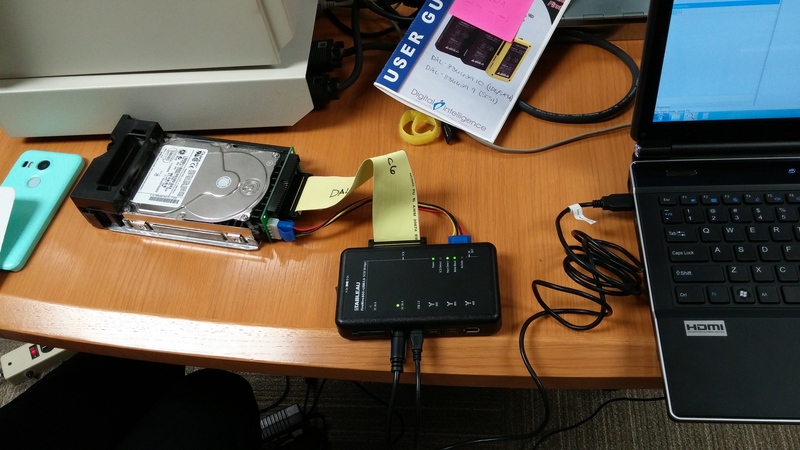 Our next bright idea was to attach a USB storage device and run a disk dump to it. We formatted a drive, plugged it in, and prepared for nothing to happen. For once, it didn’t. Instead, FIAT reported an error addressing the device that even Stack Overflow didn’t recognize. I found the error class, however: kernel issues. We thought that maybe the drive was too big, or too new, so we hunted up an older USB drive and tried again. Same result. Then we rebooted. The error messages stopped, but no new connection registered. 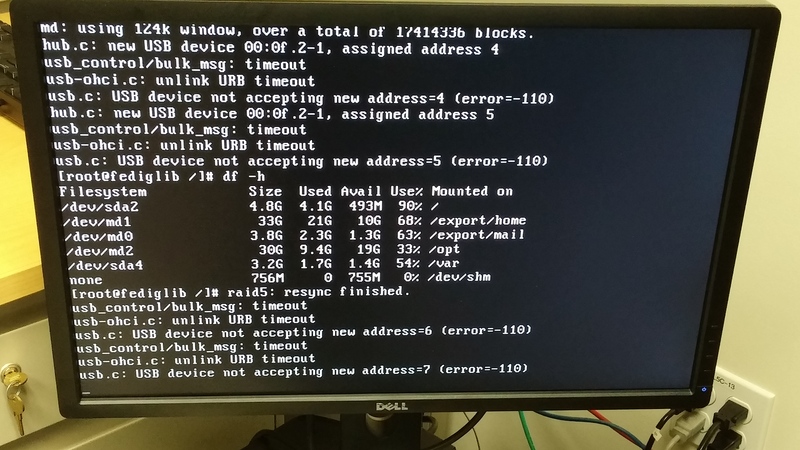 I tried stopping the service, removing the USB module, and restarting the service, but both ports continued throwing errors. USB errors outputting even as we check df -h and see only the SCSI drives. Servers are meant be networked. Hoping that FIAT’s core functions remained intact, I acquired some cables and a switch and rigged up a local access network (LAN) between FIAT and my work laptop. If it worked, we could send the disk dump command to a destination drive attached to my Mac. Or we could stare at the screen while FIAT dumped line after line of ethernet errors, which seemed like more fun. Again, I stopped the service, cleared the jobs on the controller (FIAT only had one ethernet port), restarted it, then restarted the service, but the timeout errors persisted (4). 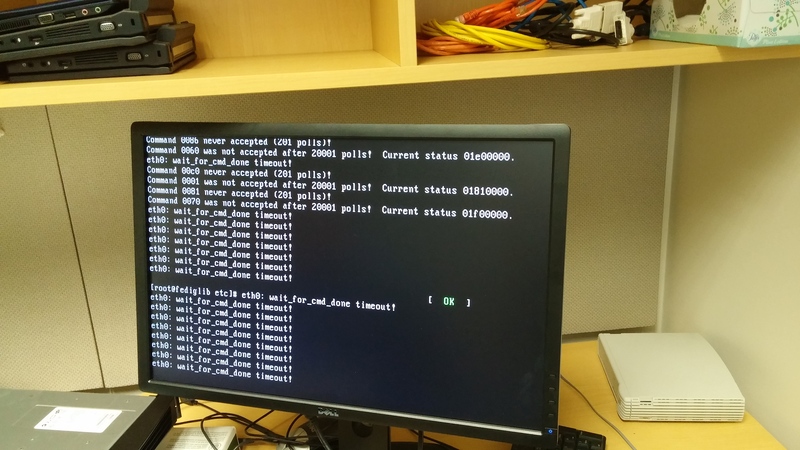 Ethernet errors outputting after attempting to connect FIAT to a LAN. FIAT’s total solipsism suggested a dead south bridge as well as serious kernel problems. While it might have been possible for an electrical engineer (ie, not us) to overcome the former, the latter presented a catch-22: even if we were willing to alter the operating system (no), the only way to fix FIAT would have been with an update, which thanks to the kernel errors, we couldn’t perform. To be clear: those three things all happened in about two hours. With about a week left, I had an idea. Other than how to convert a tower-chassis server into an end table. I discussed it with the group, and when we couldn’t find anything wrong with it, I suggested they start the final report and presentation: if this worked, we’d have something to turn in. If not, I’d write my section of the report and we’d call it done. We had found the website while exploring the filesystem. FIAT had a CD drive. I could compress and copy the website directory to a CD and we could turn that in. It wasn’t ideal, but we’d have something to show for a semester’s worth of work. So while my compatriots got the project documentation ready for ingest to the iSchool’s DSpace, I went to work on FIAT one last time. I covered my bases–researched the compression protocols Red Hat 2.7 supported, the commands I’d need, how to find the hardware location so I could write the file out once it was created. FIAT being FIAT, I hit a snag: the largest CD I had available was 700MB, but the real size of the website directory was 751MB. After a little investigation, I decided which files and folders we could live without (and put locations and my reasoning in the report): excluding them, I created an .iso smaller than 700MB. That file still resides in the directory where I put it. The final indignity, FIAT’s sting in the tail, was this: it had a CD drive, which I found with cdrecord -scanbus. What it did not have was a CD-ROM drive. Attempting to write the .iso to disk, cdrecord returned an error: unsupported drive at bus location. FIAT can read, but it can’t write. The author would like to acknowledge the efforts and contributions of their fellow-travelers, Arely Alejandro, Maria Fernandez, Megan Moltrup, and Olivia Solis, as well as the guidance and assistance of Dr. Patricia Galloway, Sam Burns, and members of the UT Austin storage ITS team, without whom none of this would have happened. 1 Redundant Array of Inexpensive (or Independent) Disks, a storage virtualization method which uses either hardware or software to combine multiple physical drives into a single logical unit, improving read/write speeds and providing redundancy to protect against drive failure. RAID arrays can be set up at a number of levels depending on user need, all of which have their own implications for preservation and data recovery. 2 Something I had no prior experience with- certainly not with a Red Hat 2.7 machine! I spent more time looking up error codes, troubleshooting, and searching for workarounds than interacting with FIAT. 3 Throughout, I used the command df -h in FIAT to display drives, and read the kernel message buffer, where information about the operating status of the machine can be read, with demsg. 4 I cannot emphasize enough how much on-the-fly learning occurred during this part- even as a low-level systems administrator, trying to get FIAT to talk to something involved a lot of new material for me.